WHO statistic show world breast cancer prevalence rate at 6.3 million (by end of 2012) spread in 140 countries. 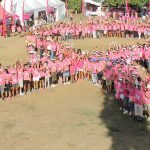 Breast cancer in Bali Province alone, the prevalence rate reached 1.233 in 2013. The highest case of cancer for women is breast cancer. The death rate nation-wide is 21.5 per 100.000 people and 70% are at an advanced stadium. Breast cancer is number one cause for women death rate in Indonesia with average age range between 30-40 years old. Around 98% breast cancer patients will survive for more than 5 years with early detection and medical help. Your donations big and small, help Bali Pink Ribbon’s work towards promoting breast cancer awareness and provide support to all those affected with breast cancer. BPR campaigns for pro-active self-breast examination and going to a hospital for an annual breast screening from the age of 35. 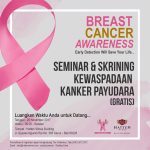 BPR conducts breast screening roadshows to the remoter parts of Bali which includes a breast awareness seminar followed by manual and mobile USG screenings by local and overseas volunteer doctors and nurses.